Copper Harbor is an unincorporated community and census-designated place in northeastern Keweenaw County in the U.S. state of Michigan. 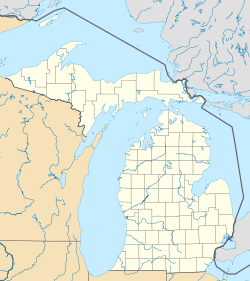 It is within Grant Township on the Keweenaw Peninsula which juts out from the Upper Peninsula of Michigan into Lake Superior. Its population was 108 as of the 2010 census. The town's name alludes to the former use of its harbor as a port for shipping copper mined from local deposits during the mid-19th century. The Pittsburgh and Boston Mining Company, formed by John Hays of Cleveland, Ohio, began operating in Copper Harbor in 1844. It was a small development at first, but its mine was modern for its time, and the company struck it rich in 1845. A few years later, the Central and other mines opened and became successful. By 1870, the copper resources had been largely worked out. Mining activity no longer exists, and the town's harbor is mostly used for recreational purposes such as snowmobiling and for a ferry that connects Isle Royale National Park to northern Michigan. The Copper Harbor Lighthouse is situated at the opening of the harbor. Nearby is Fort Wilkins Historic State Park, a restored 1844 frontier army base originally built to protect the port in the early years of the copper mining boom. The town is the northern terminus of US 41 (both in Michigan and nationally) and the eastern terminus of M-26. Both approaches to Copper Harbor, the shore-hugging M-26 from Eagle Harbor and the more inland, rugged US 41 offer dramatic views, as does the Brockway Mountain Drive overlook. Also, one can follow Manganese Road from the town's center to Manganese Falls and the Estivant Pines, among the oldest and tallest remaining stands of virgin white pines in Michigan. Copper Harbor is at 47°28′08″N 87°53′18″W﻿ / ﻿47.4687939°N 87.8884416°W﻿ / 47.4687939; -87.8884416Coordinates: 47°28′08″N 87°53′18″W﻿ / ﻿47.4687939°N 87.8884416°W﻿ / 47.4687939; -87.8884416; this puts it farther north than anywhere else in the state of Michigan, other than Isle Royale National Park. The ZIP code is 49918 and the FIPS place code is 18100. Copper Harbor has a humid continental climate. Summers are warm but rarely hot due to the moderating influence of Lake Superior, whilst winters are cold and snowy, albeit milder than areas on similar parallels to the west, due to the low-scale maritime moderation. Although winter temperatures are similar to those in nearest large metropolitan city Minneapolis a couple of degrees latitude south-west, the main difference being that April is also a winter month in Copper Harbor, since the marine effects delay spring. The temperature lag effect is so great that March holds the town's record low, and April's record low temperatures are not much warmer than those of December. ^ a b c "2010 Census Gazetteer Files - Places: Michigan". U.S. Census Bureau. Retrieved August 1, 2017. ^ Lankton, Larry (2010). Hollowed Ground. Wayne State University Press. pp. 13–14. ISBN 9780814334904. ^ Whittlesey, Charles (1852). 4000 Years of Copper Country History. Greenlee Printing Co.
^ Mansfield, John Brandt (1899). History of the Great Lakes, p. 199. J. H. Beers & Co.
^ Dunbar, Willis Frederick, & May, George S. (1995). Michigan: A History of the Wolverine State, p. 358. Grand Rapids: Wm. B. Eerdmans Publishing Co.
^ U.S. Geological Survey Geographic Names Information System: Copper Harbor, Michigan. Retrieved 2008-05-01. ^ "Copper Harbor, Michigan Climate Summary". Weatherbase. Retrieved 10 November 2015. ^ "NOWData - NOAA Online Weather Data". National Oceanic and Atmospheric Administration. Retrieved 2012-04-14. 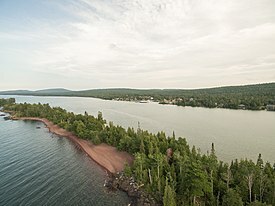 Wikimedia Commons has media related to Copper Harbor, Michigan. This page was last edited on 25 March 2019, at 20:20 (UTC).